Summary: Understand why India is regarded as the best destination for Yoga education and teacher training while going through this blog. Yoga and India come side by side in each and every mention of any of them. Nobody can separate India from Yoga and vice-versa. The ancient discipline took birth on the sacred Indian soil in the foothills of the Himalayas approximately 5000 years ago. Since its origin, the science has given birth to numerous philosophers and social leaders, who went on to shape up the great Indian society over the course of history. Every year, thousands of Yoga enthusiasts travel to India in search of a fulfilling yogic experience. Let’s understand why India is the best country for attending Yoga teacher training. There is nothing more beautiful than attaining mastery in a theory in the place of its origin. India, being the birthplace of the ancient science of Yoga offers the most traditional and purest form of Yoga knowledge. Since Yoga is a gift by India to the world and the whole planet is learning it as the biggest style of knowledge, it’s always pleasing to attain that wisdom at a place where it took birth. It’s quite an amazing experience witnessing the sacred yogic wisdom in the Himalayas. Unlike the rest of the world, where Yoga is a practice, the ancient discipline is a religion in this country; it’s like a festival, which is celebrated by almost the entire population. Since Yoga is an integral pillar of Indian religions, Hinduism, Buddhism, Sikhism and Jainism, it has contributed enormously in the making of the country’s culture. When you set your foot on the Indian soil (particularly in spiritual places such as Rishikesh, Kerala, Sikkim, Munger, etc. ), you will witness a whole new culture of Yoga with even children meditating on the banks of the rivers and on the mountain trails. During a Yoga teacher training in India, you are sure to get acquainted with Indian spiritual culture. Yoga practice and education become a blissful experience when assorted with a serene atmosphere. India is one of the most fascinating places on earth when it comes to enjoying an environment of peace and natural harmony. Learning the beautiful science of Yoga amidst the tranquil realm of the Himalayan vegetation is something that one surely dreams of. Lead your yogic journey in the Indian subcontinent and experience the highest level of spiritual calmness while you attend a Yoga training program. 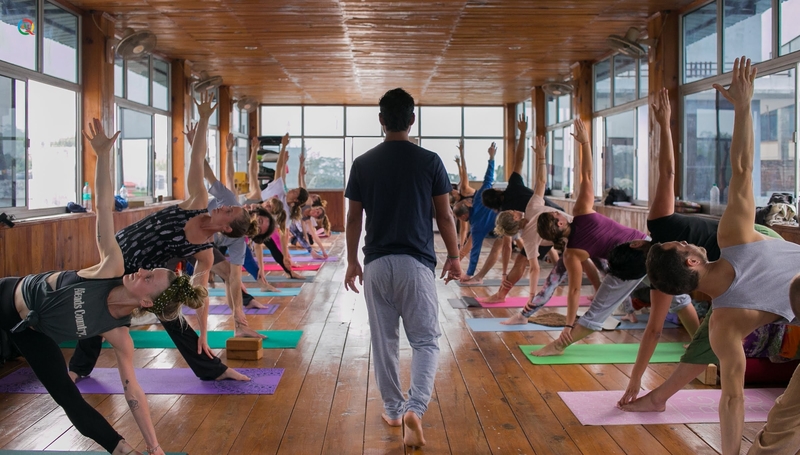 Another legitimate reason why yogis and travelers from around the world prefer India for Yoga training is the affordable stay and program fee that they get here in this nation. The country welcomes everybody with arms wide open and in the process it offers opportunities for all those Yoga-lovers, who are unable to spend too much money. All over the country, you can find a wide range of Yoga programs of various price ranges. So, pack your bag, fly off and journey to the pinnacle of Yoga with a Yoga training event in India. Nature is probably the biggest plus for India with a varied geography encompassing oceans, mountains, islands, deserts, rainforests, rivers, etc. Delving into the scintillating beauty of Meditation in the backdrop of the breathtaking beaches of Goa is one of the most amazing experiences. Imagine yourself performing Trikonasana on the high Himalayan trails to gain some incredible experience. You will be extremely fascinated to see purity pouring from the virgin natural abundance of India. Embrace the charm of picturesque waterfalls and find solace in the chilling water of India’s sacred rivers, while you devote yourself to the learning of traditional Yoga. India is home to the highest number of Yoga schools in the world. The vast Asian nation boasts of the biggest Yoga community on the planet offering you an opportunity to meet with some of the finest yogic minds. Coming in contact with many Yoga experts will give you a broad outlook into the huge world of Yoga. Whether you are interested in attaining mastery over Hatha Yoga or want to explore the beauty of Pranayama, India lets you choose a program that suits you from every aspect. Turn yourself into a Yoga teacher of the finest stature while you sail through the purest river of Yoga and spirituality in the land of devotional enlightenment, India.